After six months, Expo 67 closes in Montreal. Nearly 50 million attendees were able to view the spectacle during its six month run. 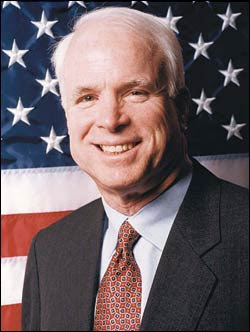 The plane of US Navy Pilot John McCain (who would later become a US Senator and then a candidate for President of the United States) was shot down over North Vietnam and, upon capture, he would spend the next 5 1/2 years in prison, two of which were spent in solitary confinement. Following his torture, he signed a confession admitting to being a war criminal. Those war wounds left him with several physical ailments but didn't deter his patriotism for his country as he built an entirely new career through political community service. Though a highly respected Senator and well-liked among his peers, he could not garner enough of his party's support to earn the presidential nomination, falling to George W. Bush in 2000. Eight years later, he secured The Republican Party's nomination and became their Presidential candidate ... but then lost the election by a wide margin to Barrack Obama. 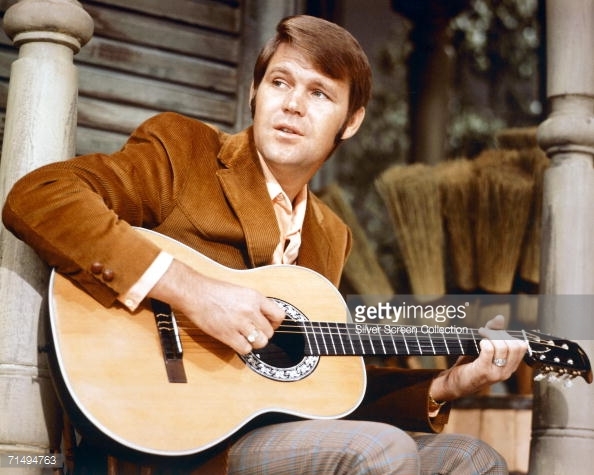 New on the charts this week is "Get It Together" by James Brown (#56), "Glad To Be Unhappy" by The Mamas and the Papas (#60), "Homburg" by Procol Harum (#66), "She Is Still A Mystery" by The Lovin' Spoonful (#67), "Watch The Flowers Grow" by The Four Seasons (a totally different sound for them at #72), "You Better Sit Down Kids" by Cher (#83) and "By The Time I Get To Phoenix" by Glen Campbell, which debuts at #90. 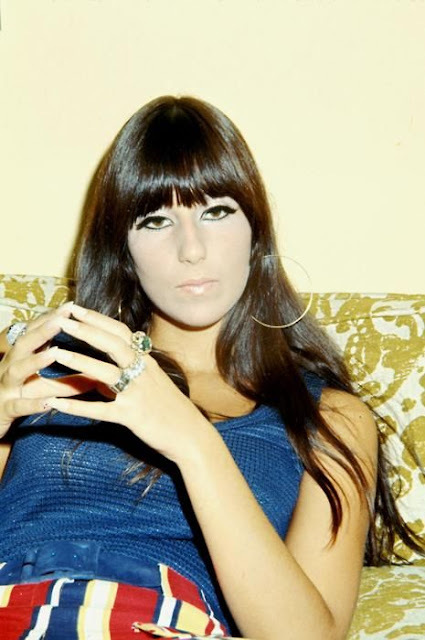 Big movers within the lower half of the chart this week include "Lazy Day" by Spanky and Our Gang (#60 to #42), "Rock 'n' Roll Woman" by Buffalo Springfield (#51 to #43), "Big Boss Man" by Elvis Presley (#57 to #46), "I Say A Little Prayer" by Dionne Warwick (which takes a HUGE leap from #86 to #47), "Beg, Borrow And Steal" by The Ohio Express (#56 to #48), "Shout Bamalama" by Mickey Murray (#58 to #50), "You Don't Know Me" by Elvis Presley (#59 to #51), "Lady Bird" by Nancy Sinatra and Lee Hazlewood (#76 to #53), "Hush" by Billy Joe Royal (#70 to #54), "Boogaloo Down Broadway" by The Fantastic Johnny C (#73 to #58), "Keep The Ball Rollin'" by Jay and the Techniques (up 31 places from #90 to #59), "I Heard It Through The Grapevine" by Gladys Knight and the Pips (#82 to #62), "Like An Old Time Movie" by Scott McKenzie (his follow-up to The Summer Of Love Anthem "San Francisco", up from #84 to #64), "Mr. Dream Merchant" by Jerry Butler (#97 to #70), "Wake Up Wake Up" by The Grass Roots (#88 to #73) and "Back On The Street Again" by The Sunshine Company (#95 to #78). 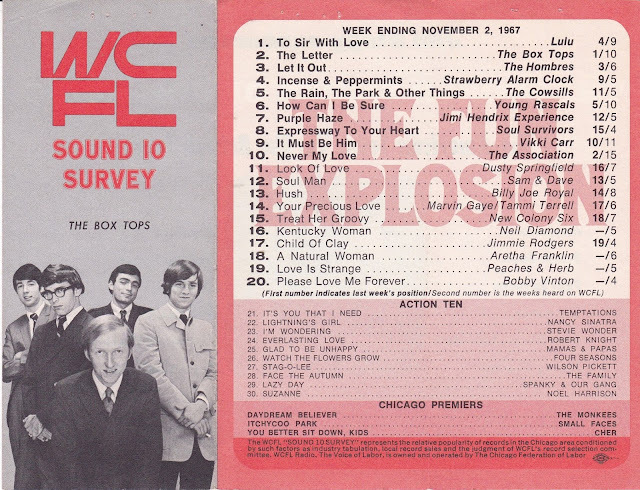 Lulu's "To Sir With Love" is Number One for the second straight week this week on the chart. 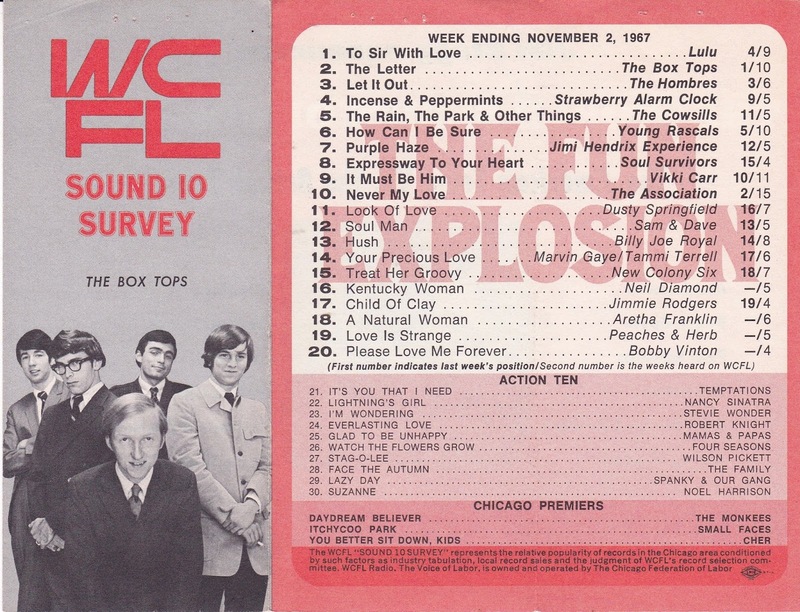 The Box Tops also hold on to the #2 position with their former #1 Hit, "The Letter". 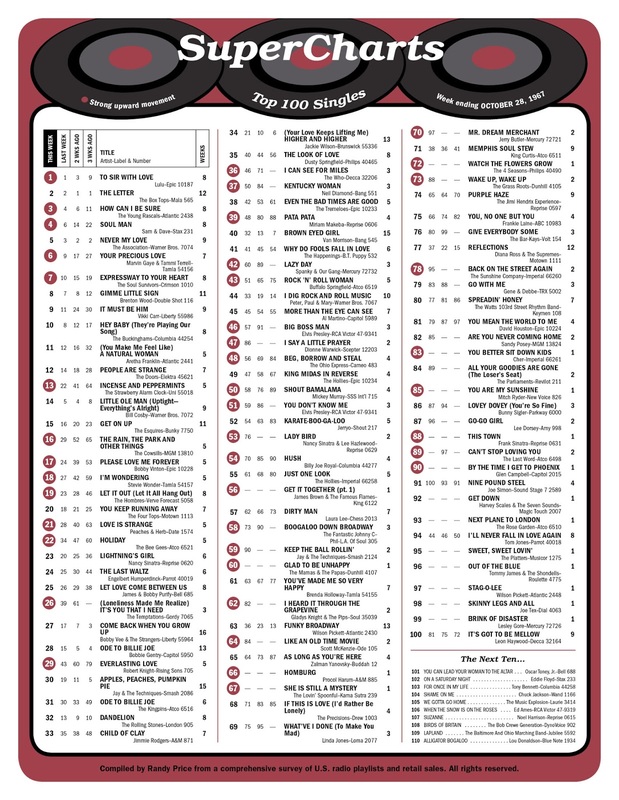 "How Can I Be Sure" by The Young Rascals climbs a notch from #4 to #3, "Soul Man" by Sam and Dave moves up two spots from #6 to #4 while "Never My Love" by The Association falls from #3 to #5. Rounding out The Top Ten we find "Your Precious Love" by Marvin Gaye and Tammi Terrell at #6 (up from #9 the week before), "Expressway To Your Heart" by The Soul Survivors (moving from #10 to #7), "Gimme Little Sign" by Brenton Wood at #8 (down from #7), "It Must Be Him" by Vikki Carr (up from #11 to #9) and "Hey Baby, They're Playing Our Song" by The Buckinghams (down from #8 to #10). 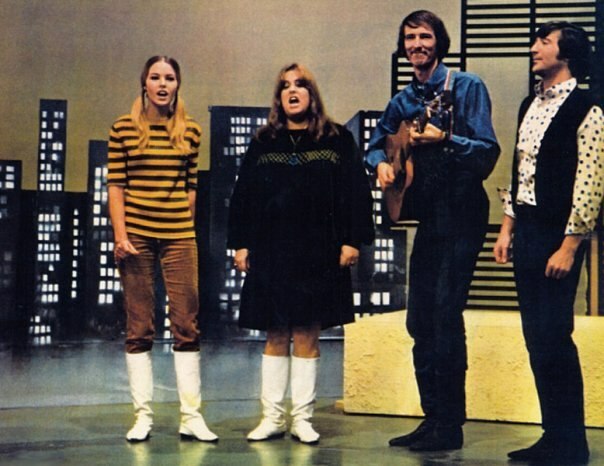 Moving up The Top 40: "Incense And Peppermints" by The Strawberry Alarm Clock (#22 to #13), "The Rain, The Park And Other Things" by The Cowsills (#29 to #16), "Please Love Me Forever" by Bobby Vinton (#24 to #17), "I'm Wondering" by Stevie Wonder (#27 to #18), "Let It Out" by The Hombres (#23 to #19), "Love Is Strange" by Peaches and Herb (#28 to #21), "Holiday" by The Bee Gees (#34 to #22), "It's You That I Need" by The Temptations (#39 to #26), "Everlasting Love" by Robert Knight (#43 to #29), "I Can See For Miles" by The Who (#46 to #36), "Kentucky Woman" by Neil Diamond (#50 to #37) and "Pata Pata" by Miriam Makeba (#48 to #39). 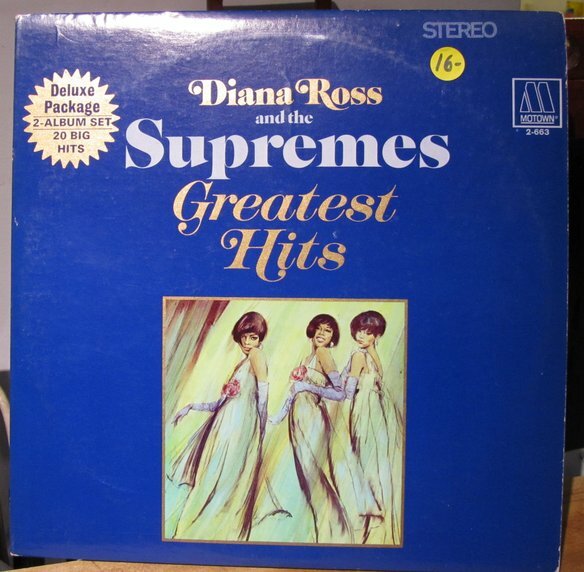 Diana Ross and the Supremes' Greatest Hits is the new #1 album in America. Although she is still pictured on the cover and did, in fact, sing on all the songs included in the LP, by the time this record hits the streets, original member Florence Ballard has been replaced by Cindy Birdsong. Lulu sings "To Sir With Love" on The Ed Sullivan Show tonight, which just happens to be the #1 Record in the country this week. Meanwhile, The Byrds are the musical guests on this week's edition of The Smothers Brothers Comedy Hour, performing "Mr. Spaceman" and "Goin' Back". We've got a brand new #1 Movie at the Box Office this week as the latest from Walt Disney Studios, "The Jungle Book" makes its way to the top, with box office receipts of nearly $4.8 million! This was the last animated film founder Walt Disney personally worked on … sadly, he died before its completion.